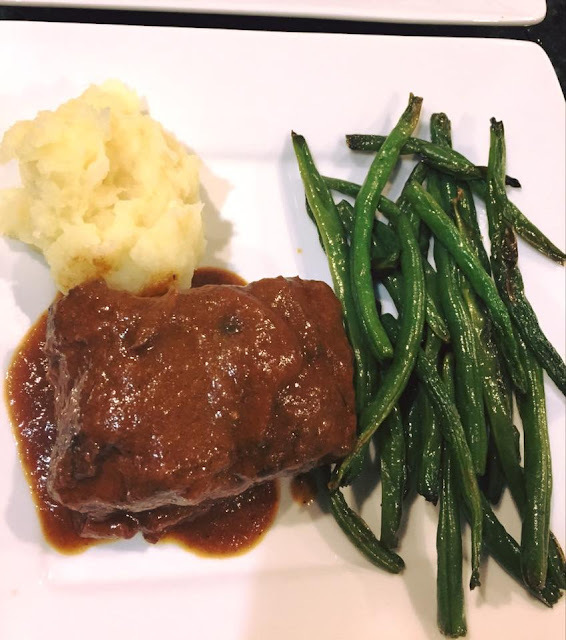 Last weekend, I made braised beef short ribs for the first time ever and their were absolutely delicious and pretty easy to prepare. All you need is about a 1/2 hour of prep time and a few more hours for braising in the oven. I served them over potato/parsnip puree and roasted green beans. This yielded 2 days worth of dinner, one lunch of leftovers and some delicious bones for the dog. I quizzed my cooking group on facebook for recommendations and put this together based one of the recipes with a bit of improve on my part. In the meantime, in a heavy duty dutch oven, heat up a bit of oil. In the meantime, dredge short ribs in flour. When the oil is preheated, brown the short ribs on both sides, about 3 minutes a side. You may need to do this in batches, DO NOT CROWD or you will not get a proper browning. Remove short ribs from dutch oven. Add a bit more oil if needed. Add shallots and leeks. Allow to brown a few minutes while scraping up meat bits from the dutch oven. Add carrots, bay leaves, thyme, garlic. Deglaze with red wine. Add the ribs back in. Pour stock or other additional liquid you are using. Cover well and place in oven. Cook in the oven for about 1 hours. Add tomato paste and mix well. Cook additional 30 minutes to an hour for a total baking time for 1.5 to 2 hours. Remove from oven. Remove meat and use immersion blender to puree the sauce. Simmer on the stove top at a low flame to reduce a bit. Taste for salt. Serve over a carb of choice like potato pure or polenta.